This is perhaps a rather unusual first page to the Newsletter, though the main reason for this is not immediately obvious. It was pinched from one of Howard's Flickr sites long ago, and appears to be an ordinary leaf from MotorCycling for 3rd March 1913. 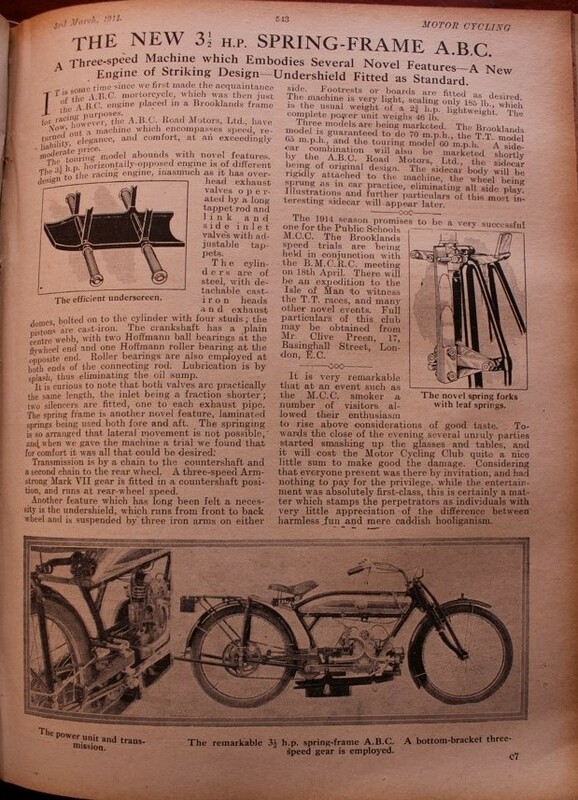 However, it is not to be found in any of the bound copies of MotorCycling (or MotorCycle) in VMCC HQ's library, and 3rd March 1913 was not a publication date for either! Can it be, I wonder, that Australia ran its own edition of MotorCycling? The engine seems to be fitted with a Fellows magneto and Zenith carburettor and the cylinder head arrangement consistent with the light car engine. 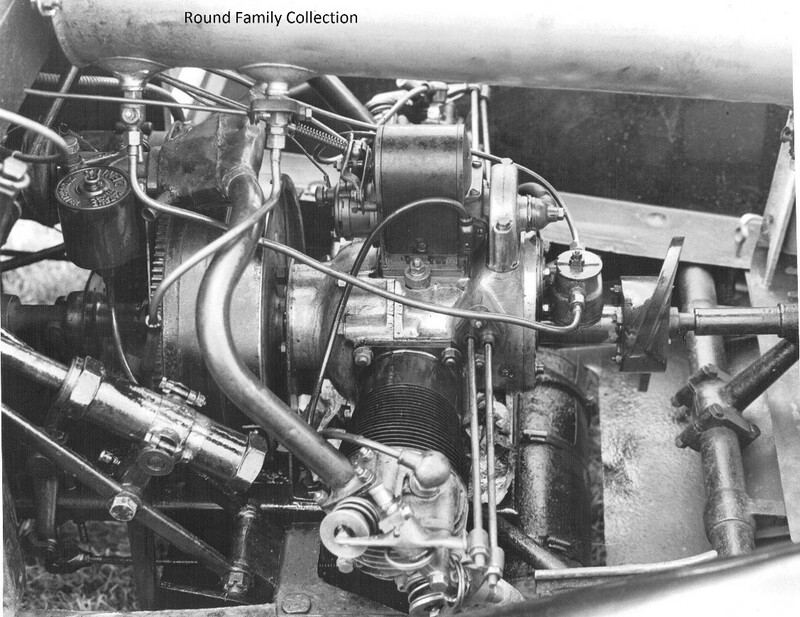 However, I suspect that the 'plumbing' modification was made to 'convert' the engine into its aero format in which a prop would have been mounted at the flywheel end of the crankshaft and the engine be mounted reversed in the airframe. I’m sure that there is a light aircraft in the Brooklands collection with such an engine. However the cylinder head arrangement is different in that the inlet manifold is underslung with the carburettor forward which would place it just behind the flywheel if fitted. Likewise the exhaust stubs of the aero engine rise upward from the cylinder heads. In conclusion - I think the engine pictured is a light car engine dressed up to look like the aero engine - whatever it is I wish it were mine! This shot comes courtesy of Ian, and shows an 'adapted' ABC engine that has been pressed into light aircraft duties, from the Shuttleworth Collection. The propellor is to the front, and I guess the lagged pipes dipping into the exhaust ports are to supply anti-icing air to the carbs at the back. Compared to the "Scorpion" in the last Newsletter, curiously enough, the inlet and exhaust-port functions seem to have been switched. I wonder if this is the 'Brooklands' machine that Martyn refers to, above. Here is another piece from Martyn, cautionary in places, but overall, a rollicking good tale! Dad bought his first ABC motorcycle in August 1955 for the princely sum of £6, it was completely dismantled and boxed together with a parts catalogue – The gentleman he bought it from assured Dad that all the bits were there – and they were, he then enthused over the design features, and Dad was bitten! 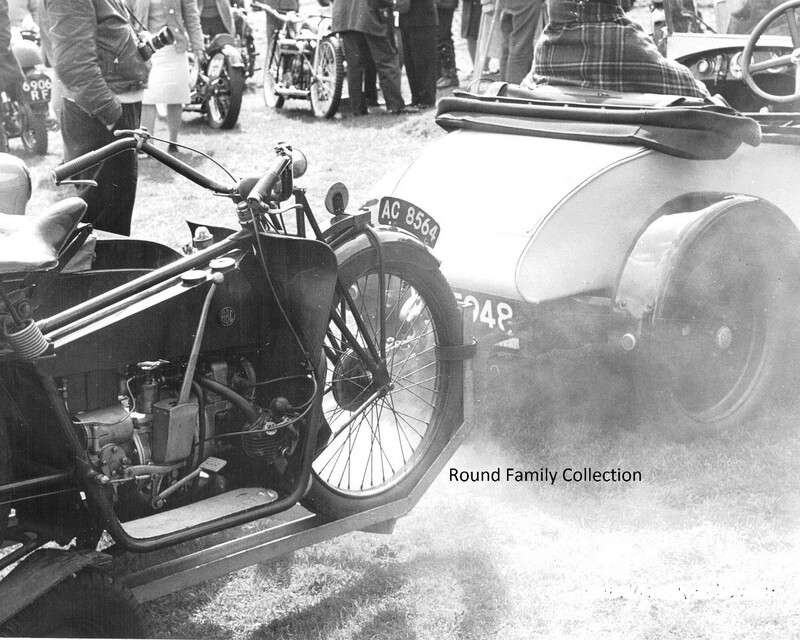 By 1960 he and his brother had acquired another two bikes and the sidecar, all of which were used extensively – and became worn out (crankshafts). During the early part of 1964 fellow Midland Region member, Jack B. announced at one of the monthly meetings that he had bought an ABC car without engine – and then asked if anyone knew of the whereabouts of an engine? At the back of the room Dad laughed and said "You’ll be lucky" and was immediately admonished by a short woman standing by with "Don’t be such a Job’s Comforter – you don’t know what my husband can do when he puts his mind to it" - so began a friendship with Jack and Laura. Jack worked in the sales and export department of the Rover car company so got about a bit and eventually tracked an engine down, how I don’t know, but it was in a ditch on a farm in Welwyn Garden City and Yes, Jack could buy it for £30. On the allotted day Jack went to Welwyn and together with the farmer and his two young children set off across the fields in the farmers ABC car! On the way Jack was asked if he'd like to buy the car! Jack bought both the car and the engine then phoned Dad and offered him the first car, a collection of bits, a very rusty body and the "Welwyn" engine. The body, which was steel on a wooden (ash ?) frame was my play-toy for the three or four months whilst the mechanics and chassis work was undertaken. The car arrived at home in a big box trailer, and was laid out in the garage before work commenced. I don’t remember much of the finer detail of the rebuild except that at supper time (10.00pm) the kitchen was full of 'vintage men' as Mom put it, and the atmosphere was just marvellous – like a private club-house. The plants, the table and seating were moved from the veranda and the chassis was laid down in late autumn 1964. By March '65 the car was almost complete, but with an important task remaining; the pistons were cast by a Mr Pearson in a small workshop near Knowle on the Warwick road out of Birmingham, and had to be 'run-in' so, with the car on blocks, a ½ hp electric motor was used to drive one rear wheel and so turn the engine over whilst Mom squirted colloidal graphite into the cylinders at hourly intervals when Dad was at work. This went on for two weeks! With completion looming thoughts turned to starting, Dad didn't want to swing it every time so some consideration was given to fitting a starter-motor. With a nephew in the competition department of J.Lucas a BRM starter motor was acquired because it 'ran the right way' and was 'available'. The flywheel was machined to accept a Ford Willeys Jeep starter ring and hey-presto, no more swinging the handle. The car went on the road on 1st May 1965 – nine months after being purchased. What of Jack's car? Well, it was finished and sold – I remember it at his house in Castle Bromwich - but never out on the road – Jack's interest was drawn by a flat twin Rover which he restored and I suspect is the one displayed at Gaydon – though I couldn’t swear to it. The final modification: after a year or so on the road Dad had a 'near miss' when travelling through Birmingham on the way to the Midland Section’s Tour of Birmingham – typically the car was towing the trailer with ABC 'outfit' aboard. The roads were wet (it often rained on Tour of Birmingham Sunday) and when a Corporation bus pulled up without signalling Dad had to stop pretty quickly, well, the rear wheels locked and everything slid down the road – fortunately without making contact with the bus! Very soon after and with the 'assistance' of Joseph Lucas (again) and the local garage proprietor, a set of discs were fitted to the front hubs with Ford Cortina track-rods as control arms to prevent the axle rolling up the leaf springs on application of the brakes. 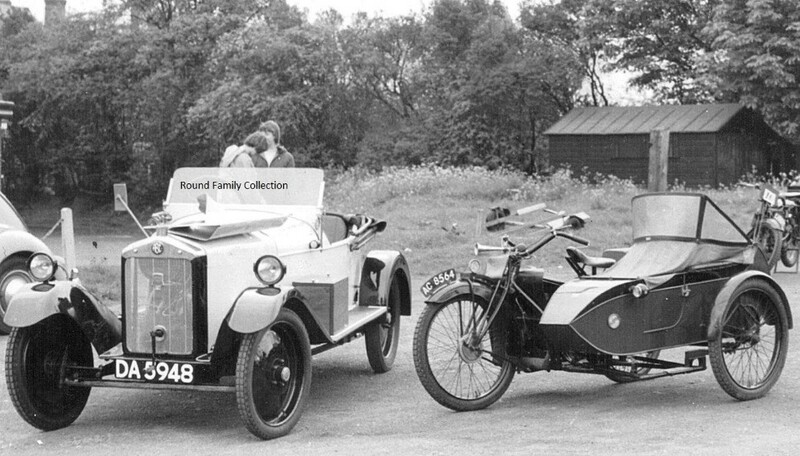 When interviewed for an article in Motor Sport Wm (Bill) Boddy commented that the car wouldn't be VSCC eligible with "those brakes" – Dad didn't care as the car now stopped and was fit for use on modern roads. Needless to say after 15 years of regular use there came the inevitable noises from the 'bottom end' and having exhausted the +0.001" and +0.002" oversize roller trick it was time for a new crankshaft. Another Jack, Jack T., happened to be the boss at Laystall Engineering, and amongst other things they produced "Chromard" or "Cromard"(?) cylinder liners and the occasional Bugatti crankshaft. They soon added a Scorpion crankshaft to their list of achievements, and the car was back on the road. What's it like to drive? Pretty good really, it has a comparatively lightweight body, and so is reasonably smart off the line for its age and engine size though the large flywheel means gear changes are a little slow (which is where the clutch brake comes in handy). The gear box took a little getting used to with its vertical gate, and my first outing saw the bloke behind looking rather startled when, after gaining the right-of-way, we proceeded sharply backwards! – 'First' is down and forward, 'reverse' is down again and forward, and easy to do in one step when you're a novice! As you’d expect, post-modification braking is good, and average speeds of 40-45 are maintained without problem. A top speed of about 60mph is possible but everything is working hard and it is unfair to try and sustain it for any length of time. As first on the road. The power unit – note the mahogany prop. It was hand-carved by a local amateur wood worker to replicate the original item, which had a split in one of the blades. The complete outfit at Stanford Hall 1968. The photo is a copy and over-exposed. In its twenty-one month history to date, I feel that the ABC Association has achieved a real if modest degree of success. Twenty-four of us are now much more aware of each other than previously, and have surely become more knowledgeable in matters ABC. I have enjoyed putting this series of News-letters together, and take this opportunity to thank all contributors and supporters to and of it. This issue features most of my in-stock copy: future items will be posted straight onto our website, with its advantages of far greater accessibility to all ABC-minded people. My particular thanks therefore go to our Webmaster and Web creator Giovanni, and may our movement thrive! Congratulations are also in order to Giovanni for another reason, that he has just become the proud owner of a Skootamota! His biggest problem so far is the sourcing of 18" x 2 1/2" beaded-edge tyres: any suggestions will be gratefully received (also, I believe, by other Skootamota owners).